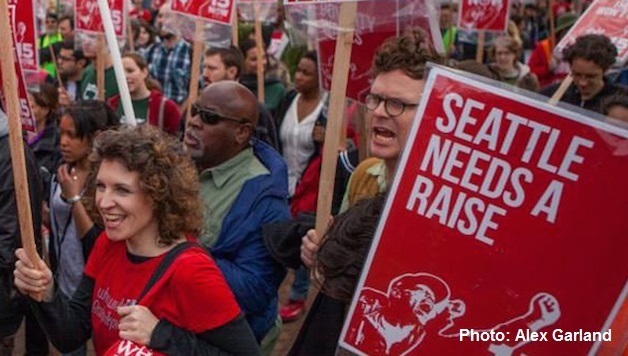 The realities of Seattle’s $15/hr minimum wage are troublesome for conservative Chicken Littles who warned that it would collapse Seattle’s economy. Propelled by workers and led by 15 Now and Socialist Alternative, the $15 movement had wrested a total of $3 billion from corporations to working families through raising the minimum wage. The new law, which started phasing into effect in April 2015, did not halt Seattle’s growing economy. In the last year, the city gained 2.5% more jobs and saw average wages grow 3.5%, both consistently higher than the national average. Armed with new data, study after study debunked the myth that raising the minimum wage hurts the poor. Against this tide of evidence, a new study from University of Washington, not yet peer reviewed, comes out with the opposite conclusion: the new minimum wage hurts low-wage workers, costing them an average of $125 per month in lost earnings through lowered hours or unemployment. Corporate media immediately seized upon the study to attack the $15/hr movement. “A campaign predicated on giving workers a raise lowered paychecks,” gloated the Wall Street Journal, telling workers that they can’t be trusted to know what’s good for them. 538.com headlined an article “Seattle’s Minimum Wage Hike May Have Gone Too Far,” willingly discarding its brandname academic credibility and joining the ranks of pop science by citing a study that hasn’t even passed peer review! These media outlets serve large corporations, which are afraid that the $15 victories in Seattle and elsewhere have emboldened workers to fight for and win living wages. Big business needs to discredit such worker-won victories, because more than the profit they could lose to a higher minimum wage what the capitalist class fears is that these empowering victories will inspire workers to wrest further gains from the bosses. The authors of the study claim “The contrast between [their] conclusion and previous literature can be explained largely if not entirely by data limitations that [they] are able to circumvent in [their] analysis.” The study looks at both hourly earnings and hours worked, citing employment data that is only found in Washington and three other states. The authors note that “This unique dataset allows [them] to measure the average wage paid to each worker in each quarter,” something that previous minimum wage studies often had to measure by proxy. The use of more specific data is welcome, and the methodology of the study deserves serious examination. So how does one look at Seattle’s tremendous job and wage growth, and conclude that its workers are being impoverished by a higher minimum wage? The biggest flaw of the study is that it doesn’t count workers who leave small business jobs for jobs at big businesses that pay more. The study looks only at single-site firms (businesses operating at one location) and multi-site firms that register each individual site (large businesses operating in many locations but registering each location independently, a rare practice). The study entirely excludes “multi-location firms that do not report employment separately by location” such as Starbucks and other large chains or franchises. While the study encompassed 89% of all firms in Washington state, the firms it analyzed accounted for only 1.7 million out of 2.7 million workers; this is because the authors did not have the data to definitively locate the rest of the firms in Seattle as opposed to the rest of the state. The study excludes up to two out every five workers, or over a million workers in total, all of whom worked in multi-site firms. The average number of employees per firm included in the analysis is only 14, while the average for excluded firms is 68, which skews the data heavily toward small businesses. This in turn erodes their conclusions, because Seattle small businesses pay a lower minimum wage due to a longer phase-in. In the years studied, 2015 and 2016, the minimum wage increased to $11 and $13 respectively for large businesses, but only to $10 and $10.50 respectively for small businesses. A minimum wage worker at a small business would gain an extra $1/hr by hopping to a large business in 2015 and an extra $2.50/hr in 2016, but because the study does not count most multi-site firms, this type of transition would not be counted as a wage increase but instead as a job loss! As the minimum wage gap between small and large businesses increases, small business workers are more and more tempted to work at larger firms, a shift which is reflected in the study’s “statistically weak evidence of reductions [in total hours worked for firms analyzed] in the first phase-in period followed by larger significant impacts in the second.” The authors erroneously claim that the second phase-in from $11 to $13 was too much of a jump and “the sum total of earnings paid to low-wage workers in Seattle might be maximized with a statutory minimum wage somewhere in the range of $9.47 to $11.” Whether a sleight of hand or an oversight, the study misleadingly takes the change in total hours worked for predominantly small businesses and attributes it to a different statutory minimum wage that only affects large businesses. The three-fifths of the workforce analyzed by the study generally saw the small business minimum wage of $10.50, not $13, while freely moving in a job market with large multi-site firms, excluded from the study, that actually did pay $13. It’s possible that the so-called job loss seen by small businesses was actually the low-wage workforce shifting to larger businesses, not counted in the study, that offered a higher minimum wage. The study also introduces a problematic definition of low-wage labor. It uses a $19/hr threshold to distinguish between a wage increase and a job loss. Someone getting a raise under $19/hr would be counted as a low-wage worker benefitting from the minimum wage increase; someone making the transition from $19/hr to $20/hr would be counted as a job loss for the low-wage workforce and dismissed as an exogenous addition to the non-low-wage workforce (presumably modeling unrelated growth in other workforces). The $19/hr threshold is constantly applied regardless of whether the statutory minimum wage is $9.47, $11, or $13. The number of low-wage workers defined this way will naturally shrink the closer the minimum wage gets to $19/hr, especially when that threshold starts off over twice the minimum wage but within a year quickly shrinks to less than 50% more. It is no accident that in spite of the study’s methodological flaws, its conclusions are being trumpeted by the corporate media, since they are extremely convenient for big business. The researchers themselves are far from neutral on their subject matter. One of the study’s authors, Jacob Vigdor, is a former fellow of the American Enterprise Institute (AEI), a pro-corporate think tank that argues for increased privatization, abolishing the minimum wage, and other anti-worker policies. The study itself has received funding from pro-corporate sources like the Laura and John Arnold Foundation, a philanthropy group founded by a former Enron trader and hedge fund manager which pushes charter schools and the looting of public pensions; and the Smith Richardson Foundation, which has been a major donor to the AEI in the past. These foundations promote a particular framework of neoclassical economics, used by the study, that is tailor-made to justify the corporate agenda of disempowering and impoverishing workers. Which variables are considered unrelated, which coefficients to analyze, what models are used, are not solely academic choices but can be influenced also by political assumptions. Studies like this are not isolated attacks on the gains of the working class. We can expect more research, articles, lawsuits, and even outright illegal actions from corporations to prevent the spread of the $15 movement. At the same time, rent, tuition, and prices of life necessities continue to rise and outstrip wage growth. These days, even $15/hr is not a livable wage! This system was not made for working people. As long as capitalists control the media, banks and housing, the state, and the large corporations that make up the bulk of the economy, they will never run out of ways or means to attack and roll back working class gains or blunt victories in one sector by jacking up prices in another. To truly win living wages and a humane society we need to toss out the capitalists, take democratic ownership of the Fortune 500 companies that make up three quarters of the economy, and run the state and economy democratically under workers’ control. We need a socialist transformation of society.